June, an optimistic, imaginative girl, discovers an incredible amusement park called Wonderland hidden in the woods. The park is full of fantastical rides and talking, funny animals – only the park is in disarray. June soon discovers the park came from her imagination and she’s the only one who can fix it, so she bands together with the animals to save this magical place and bring back the wonder in Wonderland. KIDS FIRST! Film Critic Ivey H. comments, “This animated fantasy film is awesome! It has a good message for younger viewers, is whimsical, bright and colorful.” Nathalia J. adds, “This refreshing film will have you on the silliest adventure ever. Make sure to buckle up for this wild ride through the imagination of the “Wonders in Wonderland.” See their full reviews below. The storyline is about a little girl’s extraordinary imagination. She and her mom have a special bond, sharing a passion for creating a magical place called Wonderland. Then, an unexpected life-changing event occurs, causing June’s world to change forever. She becomes very depressed and decides to put Wonderland away. She quits doing the things she loves most. Will the wonder ever come back to Wonderland? The lead character June is played by Sofia Mali. Her voice-over work is outstanding. You’re really able to connect with her adventurous heart, emotions and struggles as she experiences them. Steve, the porcupine is played by Jhon Oliver. He secretly admires Greta the hog. He had me laughing throughout the film. Whenever he gets nervous, he loses his sharp quills and you had better run! The jokes in this film are very practical, as June is somewhat of math genius. Some of my favorite scenes are the homemade roller coaster that June and the neighborhood kids attempt to make. One particularly funny scene is when they are on the bus and June wants to escape. This is when she discovers there is really a Wonderland. The park is full of unexpected rides, zero gravity fun and chimpanzee zombies. 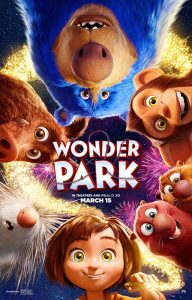 June remembers how she created Wonder Park by whispering into her stuffed animal Peanut’s ear and remembers that anything is possible. Her stuffed animals are her inspiration and caretakers of the park. The music and singing really carries you through the scenes. They are very relaxing and beautiful. The theme song “Wonder” was written by Ali Dee, Doug Davis and Anthony Mirabella and performed by Rachel Platten. The screenplay is written by award-nominee Josh Appelbaum. The animation by Peter Chan and Nathan Fowler is simply marvelous. It is colorful, unique and imaginative – from the beautiful sky to the detailed roller coasters, to the crazy popping popcorn machine. This animation should be acknowledged because it is amazing to see the Wonder Park as such a bright and innovative Wonder Land. Photos © 2018 Paramount Animation, a division of Paramount Pictures. All rights reserved. This entry was posted on Sunday, March 17th, 2019 at 3:48 pm and is filed under Feature Film Reviews. You can follow any responses to this entry through the RSS 2.0 feed. Both comments and pings are currently closed.